The only song in Latvian language is great ballad performed by Gunars Kalnins. Very interesting guitar duet with anthemic ballad. Единственная песня на латышском языке - это прекрасная баллада в исполнении Гунарса Калныньша. Интересный гитарный дуэт с гимновой балладой. Еще один гимновый номер в поп-рок обработке. 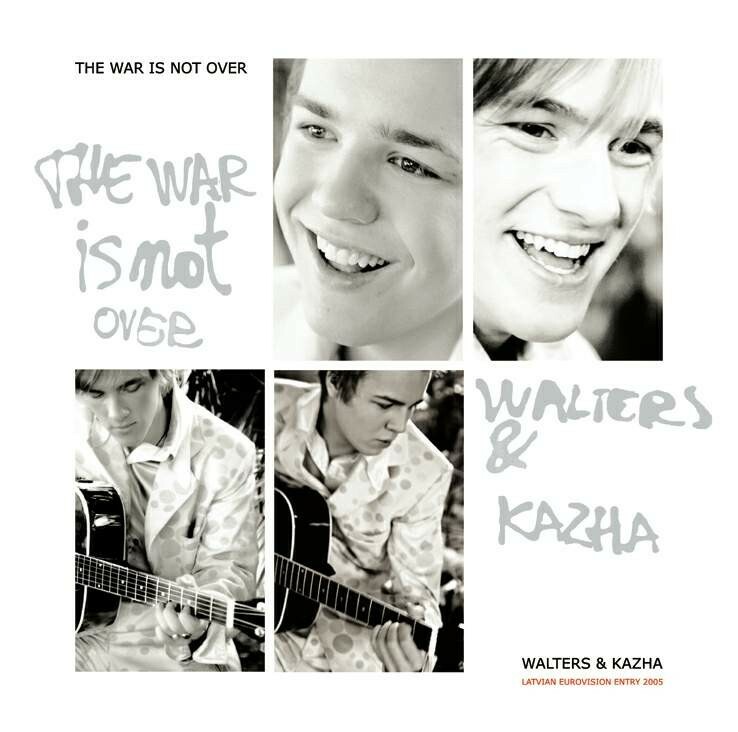 Latvian Eurovision participants of ESC’ 2005 Walters & Kazha have just released their CD Maxi single on MicRec PM Label. Walters & Kazha are members of the band “Putnu Balle” and their track “Another Creep” will also appear on the single. This single will now be released only in Latvia. After the contest it will be available from Microphone Records and their EMI partners in Europe. Представители Латвии на конкурсе Евровидение 2005 Валтерс и Кажа выпустили Макси сингл на лейбле MicRec PM. "Да, война не окончена, она только начинается", - говорят члены дуэта "Мы начинаем бороться за наше место на Европейской музыкальной сцене. Мы готовы показать все, на что мы способны на полуфинале кокнурса Евровидение. Основная причина выпуска этого диска - раскрутка нашей песни и показ наших музыкальных предпочтений, поскольку формат макси сингла позволяет включить нам и другие треки. Многие сравнивают нас с дуэтом братьев Ольсен (победителей Евровидения 2000) и даже называют нас "маленькими Ольсенами"! Поэтому мы решили перепеть их песню Fly On The Wings Of Love и вы можете найти ее на нашем макси сингле. Надеемся, что она и нам принесет удачу!" Валтерс и Кажа являются членами группы Putnu Balle, поэтому на диск включен трек Another Creep. Сингл выпущен только в Латвии, после конкурса он будет доступен через сеть Microphone Records и их партнеров EMI в Европе. Walters & Kazha, the representatives of Latvia in the Eurovision Song Contest in Kiev, have been singing since they were two years old. Now Walters Fridenbergs is 17 and Karlis Bumeistars 18 years old. Their musical career started in the children pop band "Dzeguzite" . They became popular performing the songs of the famous Latvian composer Raimonds Pauls. Together with the children pop band, Walters & Kazha have performed in 22 countries, also in the famous Madison Square Garden in New York. Both guys have been singing in the group "Putnu balle" for two years now and working together with Martins Freimanis, a singer and composer, a member of the group "F.L.Y." that represented Latvia in ESC'2003 in Riga. In April, the debut album of the group will be released, and Martins Freimanis is the author and composer of the included songs. Of course, the Latvian entry "The War Is Not Over" also is included. During 15 years on the stage, Walters & Kazha have learned to communicate without needless gestures - just at a glance, and the guys believe it's their advantage. Every concert is special because the guys are not afraid of improvisation and changes of the style - they trust one another. Walters & Kazha took part in the Latvian National Final for the first time. "We couldn't imagine something like that, but if you are dealing with Martins Freimanis you can expect just anything." Martins Freimanis was born in 1977, on February 7., in Liepaja. Since graduating from the secondary school in the town of Aizpute, he returned to Liepaja guided by one and only aim - to sing. That's where he met the band "Tumsa". As a member of this band, Martins Freimanis has released 5 albums. Martins has also successfully started his actor carrer staring in the rock-opera "Kaupen, My Dear", by M.Zalite and J.Lusens, he's managed to host the reality show "The Robinsons" and played one of the leading roles in the feature "Take me home". Martins Freimanis has participated in several project like "F.L.Y." 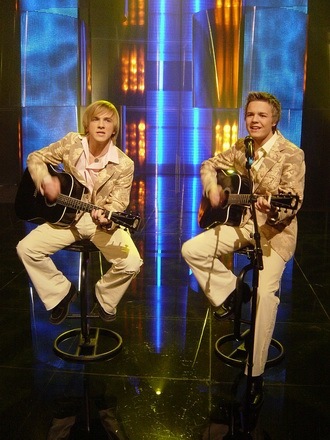 together with Lauris Reiniks and Yana Kay, representing Latvia in ESC 2003 and releasing the album "Never Look Back". On October 23, 2004 the band "Tumsa" celebrated its 13th anniversary - it was a huge concert with the Liepaja Symphonic Orchestra and guest starts. At the same time, the first reciter by Martins Freimanis "Grass for a Rabbit's Soul" was published. Валтерс и Кажа, представители Латвии на конкурсе песни Евровидение в Киеве пели с возраста двух лет. Сейчас Валтерсу Фриденбергсу 17, а Карлису Бумейстарсу 18 лет. Их музыкальная карьера началась в детском ансамбле "Кукушечка", руководителем которого был маэстро Раймонд Паулс. Вместе с этим ансамблем Валтерс и Кажа выступила в 22х странах, включая знаменитый Мэдисон Скуэр Гарден в Нью-Йорке. Уже два года ребята поют в группе "Putnu balle" и работают с Мартином Фрейманисом, певцом и композитором, членом трио FLY, которое представляло Латвию на конкурсе 2003 года в Риге. В апреле будет выпущен дебютный альбом группы, автором всех песен будет Мартин Фрейманис. Естественно в альбом войдет и трек "The War Is Not Over". За 15 лет совместных выступлений на сцене Валтерс и Кажа научились понимать друг друга с одного взгляда, и ребята считают, что это их первое преимущество. Каждый их концерт никогда не бывает похож на предыдущий, ведь они не боятся импровизировать и петь в разных стилях. Валтерс и Кажа впервые принимали участие в национальном отборе "Мы даже ничего подобного себе не представляли, но если ты имеешь дело с Мартином, то можно ожидать все что угодно". Мартин Фрейманис родился 7 февраля 1977 года в Лиепае. Закончив школу в городе Аизпуте, он вновь возращается в Лиепае с единственной мечтой - петь. Там он встречается с группой Тумса, вместе с которой он записал уже 5 альбомов. Мартин также удачно начал свою актерскую карьеру, снявшись в рок опере "Kaupen, My Dear" авторов М.Залите и Й. Лузенса, был ведущим реалити шоу "Робинзоны" и играл одну из главных ролей в фичеринге "Take Me Home". Мартин участвовал в ряде совместных проектов, таких как трио "F.L.Y." вместе с Лаурисом Рейниксом и Яной Кэй, представлял Латвию на Евровидении 2003 и выпустил альбом "Never Look Back". В октябре 2004 года группа Тумса отметила свою 13 годовщину масштабным концертом с симфоническим оркестром. - Hello, dear Walters and Kazha and our congratulations for winning Latvian national final. How do you feel now, being selected a Eurovision singers? - It's really great being chosen as participants from Latvia. We feel a bit exhausted doing all we have to do now, but it's what we do and we enjoy it. - How did you get the idea to participate in the Latvian preselection this year? - Our songwriter and really good friend Martins Freimanis (participated in ESC with FLY) got the idea. So he phoned us and said 'Guys, I have a song for ESC. You'll have to sing it' And so now we are where we are. - Was it difficult to win this time? Were you expecting that voters and jury members would choose your song? - It's difficult all the time but in different ways - yes it was hard because we wasn't sure that we'd go to Kiev. We hoped that people will like the song and they liked it - it's really great. - I think almost all the songs had the chance to go to ESC. I liked Marta and Nicol, but it's only mine - Walters' opinion. - Are you usually following the Eurovision contest? What do you think about previous Latvian representatives? - It's hard to tell about others because my opinion is only mine. I really liked 'Hello from Mars' but Europe didn't. But we now what is what and who is who . -What will be your aim in the contest, are you looking for win? - We are looking forward doing all the best. The primary thing is to sing good and with attitude, and then everything will be all right. - What as do you think can make your song stand different from the other competitors? This year a lot of performers went for the ballad songs and songs with social lyrics, and how you are planning to make your song one to remember? - You'll see it at the contest. - Have you already heard other participating songs in ESC 2005 and what is your opinion on them? - No, not yet but we are to do it. - How can you describe your song in one sentence? - Song is about our life and attitude towards it, 'someone's the looser, someone's the winner, but I don't want to believe' that it is so. - Do you like to cooperate with Martins Freimanis? - Yes - he is a really great friend and person. He trusts us and we trust him. - Was this song especially written for you two and for the Latvian preselection? - Yes, the song was made for us and for the LV preselection. And it went good. - Do you think that the message of the song can be really noticed by the viewers? - You are still pretty young but already experienced, is that helping you to be confident on the stage? - Yes, because we know each other for 15 years and we just know what will other do next second on the stage. - Are you planning to record song is some other languages? May be some remixes? - Not yet, because English is an international language, but we'll see. - Some things but not radically. - It will be different but all of it you'll see in Kiev. - Will backing singers/ dancers be used? - Yes - on 16 of April we will be in Lithuania, but from 19. - 21 of April in Kiev. May be in Estonia, Finland, too. - Are you going to send live performance from NF as preview video, or have you already shot some new video? - Just now we are editing the new video and we will send it across the Europe. - Let's speak on your career. Do you think consider yourself already popular? - No, not yet and I don't know when we will be. I think that Scorpions, White Snake, OZZY are popular, but we have to grow and grow 'till we will get to the level they are. - I think that pop rock, because it's the style people enjoy most and we sing good in the kind of style. - What are your other plans this year? Are you planning to work together as duet or in Putnu balle? - Now we have to make an album with Putnu Balle and that's what we do. - Scorpions, White Snake, OZZY (almost all hard rock singers that where popular in 70's and 80's). But from the new ones - The Darkness. - Enjoy the show of ESC!!! Hope to see You there. - Thank you very much for the interview and see you in Kiev! Good luck! - Привет Валтерс и Кажа! Наши поздравления с победой в Латвийском национальном отборе. Что вы чувствуете сейчас, будучи выбраными конкурсантами Евровидения? - На самом деле, это очень здорово стать участниками из Латвии. Мы правда уже немного устали от всей подготовительной работы, которой нам сейчас приходится заниматься, но это необходимо и мы стараемся получать от этого удовольствие. - Как к вам пришла идея принять участие в Латвийском отборе этого года? - Наш автор и очень хороший друг Мартин Фрейманис, который участвовал в Евровидении в составе группы FLY позвонил нам и сказал "Ребята, у меня есть подходящая песня для Евровидения. И вам придется ее исполнять". Вот так все и получилось. - Было тяжело победить? Ожидали ли вы, что зрители выберут именно вашу песню? - Да, было нелегко - мы абсолютно не были уверены, что именно мы поедем в Киев. Но мы надеялись, что зрителям песня понравится, и мы рады, что так и произошло. - А как вам понравились другие песни с отбора? - Я думаю, что у очень многих песен были шансы на попадение на Евровидение, мне понравились например песни Марты и Николь, но это только мое, Валтерса, мнение. - А раньше вы следили за конкурсом Евровидение? Что вы думаете о прошлых участниках от Латвии? - Не скажу за всех, но мне очень нравилась песня Hello From Mars, а вот Европе почему то она не понравилась. - Какова ваша цель в конкурсе, вы будете стремится к победе? - Мы будем стараться сделать все, что в наших силах. Прежде всего - это хорошо, с настроем, спеть и тогда все будет в порядке. - Что вы планируете сделать, чтобы ваша песня выделилась на фоне остальных? - А вот это вы увидите на самом конкурсе. - Вы уже слушали другие песни участников? - Нет, пока нет, но мы обязательно будем их слушать. - Как вы можете описать вашу песню? - Это песня о нашей жизни и об отношении к ней, что "кто то здесь победитель, а кто-то проигравший, но я не хочу в это верить", вот этим все сказано. - Вам нравится работать с Мартином Фрейманисом? - Да, он очень хороший человек и друг. Он доверяет нам и мы доверяем ему. - Была ли эта песня написана специально для вас и для отбора? - Да, как я уже говорил, специально для нас. И как мы подтвердили - это не была ошибка. - Вы думаете, что смысл песни будет понят зрителями конкурса? - Да, все что вам придется сделать, это попытаться осмыслить слова, и тогда все будет в порядке. - Вы еще очень молоды, но у вас уже солидный опыт, это помогает вам быть более уверенными на сцене? - Да, мы знаем друг друга уже 15 лет и мы чувствуем что другой сделает через секунду на сцене. Это конечно очень помогает. - Вы планируете записывать песню на других языках? Может быть ремиксы? - Пока нет, поскольку английский - это тот язык, который понятен всем, а потом посмотрим. Пока же мы готовим специальный сюрприз для фанатов конкурса. Мы уже получили лицензию от дуэта Ольсен Бразерс и собираемся записать их песню в нашем стиле. Потому что некоторые в Латвии в шутку называли нас молодыми Ольсенами, мы решили воплотить эту шутку в правду. - Будете ли вы что-то менять в аранжировке? - Да, кое что, но не так радикально. - Будет ли ваше выступление на конкурсе похожим на выступление на национальном отборе или вы планируете подготовить что-то новое? - Оно будет отличаться, а насколько - вы увидите в мае. - Будете ли вы использовать бэк вокалистов или подтанцовку? - Нет, потому что народ выбрал нас такими как мы есть, и надо считаться с его мнением. - Вы планируете промо тур? - Да, 16 апреля мы будем в Литве, а с 19 по 21 апреля в Киеве. Может быть еще поедем в Эстонию и Финляндию. - Вы планируете послать в качестве превью видео выступление с национального отбора, или это будет новое видео? - Да, новое, как раз сейчас заканчивается его монтаж. - И давайте немного поговорим о вашей карьере. Вы считаете себя популярными? - Нет, и даже не знаю, когда мы станем. Популярны это Скорпионс, Уайт Снэйк, Оззи, а нам еще расти и расти до такого уровня. - Вы пытались петь в различных стилях, какой из них ваш любимый? - Я думаю, что поп рок, потому что людям он нравится больше всего и мы в нем довольно неплохо поем. - Каковы ваши планы на этот год? Вы планируете продолжать работать дуэтом или в группе Putnu Balle? - Сейчас у нас задача записать альбом в Putnu Balle и мы пока концентрируемся на ней. - Можете ли вы назвать каких либо ваших любимых исполнителей с мировой сцены? - Как я уже говорил - Скорпионс, Уайт Снэйк, Оззи, все хард рок исполнители 70х-80х. Из новых групп - The Darkness. - И наконец если вы хотите оставить какое-то пожелание посетителям сайта? - Надеюсь вам понравится Евровидение! И мы ждем вас там! - Спасибо большое за интервью, увидимся в Киеве! Удачи!